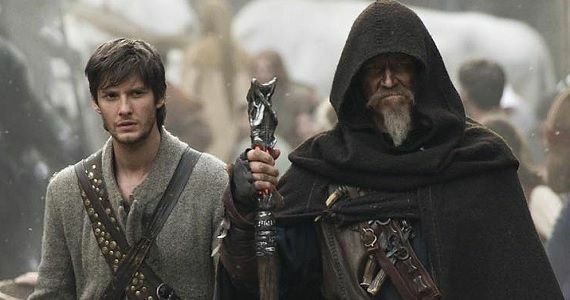 A sword-and-sorcery epic built around Jeff Bridges, Bridges’ curmudgeonly accent, Bridges’ “Wild Bill\R.I.P.D.” goatee and Ben Barnes, it has Moore as the villain, a witch whom Bridges’ character must kill. Playing a witch, as Meryl Streep or Susan Sarandon will tell you, calls for “big.” Moore is the queen of small — intimate, internal. So as Mother Malkin, out to avenge herself on the “spook,” Gregory (Bridges), Moore is miscast. That’s OK, though, because Bridges is big enough for the both of them. Gregory is a grizzled, Falstaffian knight, all tight-lipped boozy bluster and wit. He’s in need of a new apprentice, a “Seventh Son” of a seventh son. That’s where Tom (Barnes of “Prince Caspian”) comes in. He’s a pig farmer’s son, handy with a knife, carrying a magical amulet from his mother (Olivia Williams) as his protection. The old knight is full of wisdom, which he shares. They’re entering a world “where legends and nightmares are real.” There are all sorts of spirits, monsters and witches, and Gregory knows all their names. He exorcises children and vanquishes monsters — for a price. The plot, taken from a Joseph Delaney novel, drives spook and apprentice toward a final fight with the witch queen, her allies (Djimon Hounsou among them) and their minions. Alicia Vikander of “Anna Karenina” is Alice, a temptation to Tom, and possibly a witch. She’s a looker with little screen presence. Sergey Bodrov (“Mongol: The Rise of Genghis Khan”) directs and stages some splendid if repetitious fights and flights, most of them involving digital dragons and such. This is strictly by-the-numbers movie-making, genre work that makes the most of our lowered expectations. Still, it’s great seeing Bridges give fair value in a part befitting an aging warhorse reduced to pitching, on the Super Bowl, a “Dreaming with Jeff” album designed to put us to sleep. Gregory, gumming his zingers like a classic coot from any number of Westerns, manages to keep us awake for the 104 minutes of “Seventh Son.” Barely. Credits: Directed by Sergey Bodrov, screenplay by Charles Leavitt and Steven Knight, based on a Joseph Delaney novel. A Universal release. This looked like a January/February movie from the first glance I got of the trailer.